Hospice care is about making the time you have left the best it can be. Hospice care aims to reduce physical, emotional and spiritual discomfort through pain and symptom management, counseling, and other supports for patients at the end of life as well as their loved ones. These services are all provided within the comfort of home. Our goal is for you to be as comfortable as can be, so you are able to be as independent as possible, for as long as possible experiencing the people and activities you enjoy. We embrace an individual’s end-of-life goals and the right to make choices about care. We work with you and your family to ensure that your care plan honors your wishes, provides the highest quality of comfort, and offers the support that you and your family need. Our team provides ongoing education and can assist you and your loved ones in coping with changes and decisions throughout the course of hospice care. The goal is for you and your loved ones to have meaningful and worthwhile moments for as long as possible. 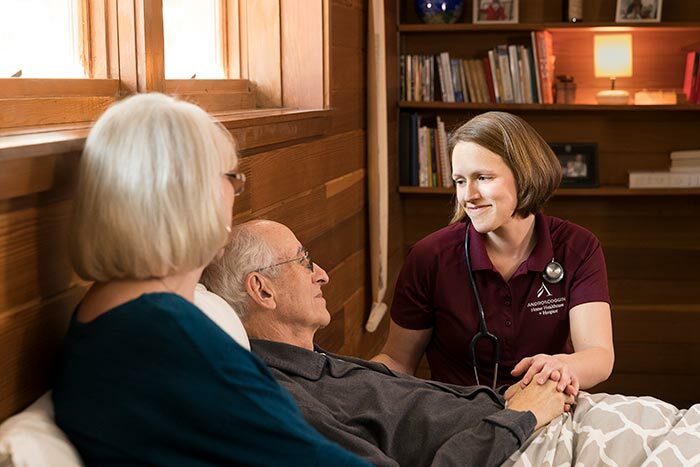 A blending of medical, psychological, social and spiritual services: The hospice team is dedicated to acknowledging and honoring life through a holistic approach. Medication: Our staff orders medication for you and has it delivered to your home at no cost. Most hospice families also receive an emergency medication pack to have on hand if needed. Medical equipment: Any equipment such as oxygen, hospital bed, wheelchair, commode or shower seat is covered at no cost to you and arranged for by our staff. On-call registered nurses: Available 24 hours a day, 7 days a week to answer questions, concerns, or offer support if there are unexpected changes. The nurse will determine if an immediate visit is needed. Complimentary therapies: Reiki, music, pet and comfort touch intended to improve quality of life. Our staff is available 24 hours a day, 7 days a week, 365 days a year. Designed for hospice patients who are experiencing memory loss or other forms of dementia, we provide an individualized approach to care that embraces the patient’s life story, preferences, and interests to reduce agitation or confusion. Consistent hospice staff and/or volunteers develop a one-on-one bond with the hospice patient and family, delivering regular communication and education and acting as a resource. We understand that terminal disease can be unpredictable. Should curative treatments be deemed appropriate, you can change your decision to receive hospice care. In the event that your condition continues to decline, you can easily resume hospice care with us. Opened in 2005, the Hospice House is an inpatient facility that caters to hospice patients who need intensive pain and symptom management and support of their terminal illness beyond what can effectively be provided in home or a long-term care facility. It is our goal to stabilize pain and symptoms so the patient can resume hospice care in their home setting. Nestled in the countryside of Auburn, Maine, the Hospice House has an intentional home-like feel. Each private suite features a bedroom with patient bed and full-sized sleeping accommodations for family/friends, living room, and floor-to-ceiling windows to welcome natural light and views of the outdoors. Delicious homemade meals prepared daily with extra attention given to patients’ special requests. Multiple therapy options, whirlpool baths, and beauty treatments available to all patients. 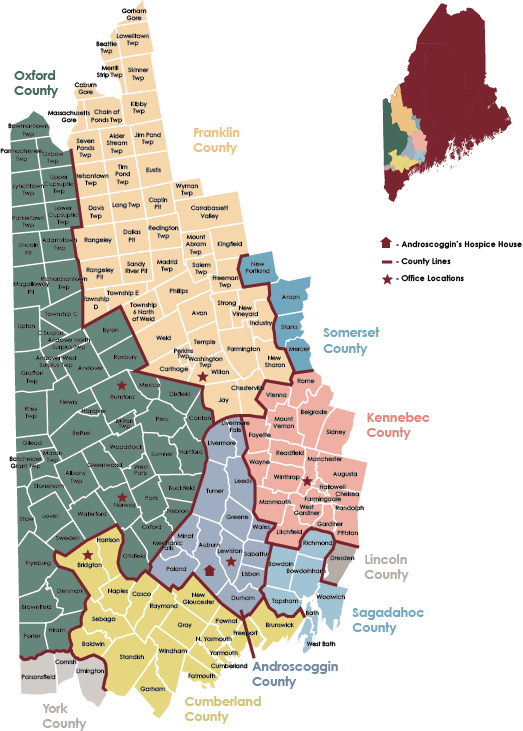 Hospice care is covered by Medicare, MaineCare and private health insurance. We can also help if you qualify but do not have the ability to pay for services. If you could benefit from our home hospice services call our Intake Team at 207.777.7740 or use the form on this page.